Army Chief Warrant Officer George A. Howes, of Knox, Indiana, will be buried August 5, 2011, in Arlington National Cemetery. On January 10, 1970, Howes and three aircrew members were returning to their base at Chu Lai, South Vietnam aboard a UH-1C Huey helicopter. Due to bad weather, their helicopter went down over Quang Nam Province, Socialist Republic of Vietnam (S.R.V.). A search was initiated for the crew, but no sign of the helicopter or crew was spotted. KNOX, Indiana-- A local soldier whose remains were missing for more than four decades came back home to Knox Monday night. 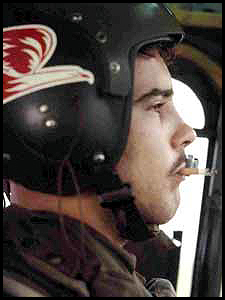 Andy Howes was a helicopter pilot in Vietnam when he and his crew disappeared. Monday night, the community turned out to welcome home a hero. With hands across their hearts and tears in their eyes, people in Knox waited 41 years to say ‘hello’ but more importantly, ‘thank you’ to an old friend. Rosie Rose grew up with George Andrew Howes, better known as Andy. She said military was in his blood. “From the time he was in 1st, 2nd and 3rd grade, he addressed every adult as sir and m ‘am,” said Rose. At 19, Andy proudly served his country as a helicopter pilot in the Vietnam War. But January 10, 1970 was the last time anyone would ever hear from their hometown hero or the crew he traveled with. “There was an emptiness you cannot imagine,” said Rose. Now, Andy is finally home. “Without any of these guys’ work, we wouldn’t be able to be here and show our respect," said Nathaniel Hollis. This hero’s welcome was a long time coming, just eight months ago, The Army identified Howe’s remains using DNA. The procession through Knox stretched for miles through a sea or red, white and blue. After decades of hoping and wishing, everyone here says their prayers have been answered. “That’s a lot of years, but it got done,” said Bertha Clabaugh. Funeral arrangements are set for Tuesday at the Knox Community Center. Visitation begins at 6 P.M. Central, the funeral will follow at 8 P.M Central.